today's polish is Julep Paris, the last of my May 2013 Julep Maven 'It Girl' box. 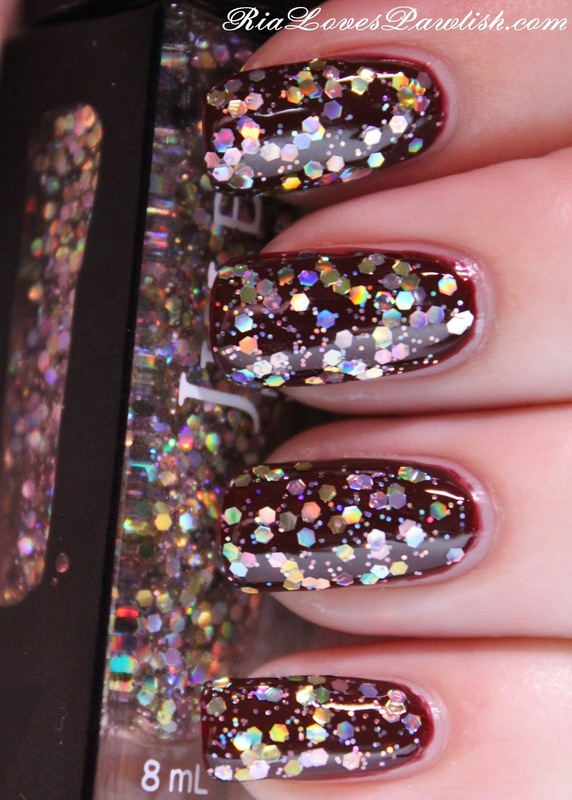 it's a beautiful glitter with gold, silver, and pink hex pieces that are all holographic! there are also tiny holo pieces... the combo makes for a striking look! it's a little tough to work with, it wants to clump a bit and not spread evenly, so some placing will be necessary. at first i didn't think it was worth the extra work... but my mind has changed! i layered it over my Julep Coco mani and i got loads of compliments on the look, it's really fun and beautiful. a coat of topcoat smooths it out and makes everything shiny! one coat Julep Paris, one coat Seche Vite... all over my Julep Coco mani. I always want to add your pics to my Pinterest but never can because you would have to add the "addthis" code/icons to your blog so we could share your photos. oh, wow, thanks! i'll try and figure out how to get those on there, i'm not very savvy! It's so beautiful!!!! Love it!